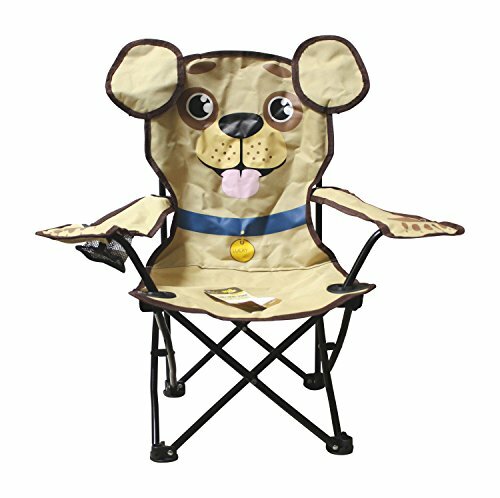 This adorable lucky pup folding camp chair for kids is made of high strength durable steel frame and a comfortable strong nylon material and includes armrests and a cup holder. It opens and folds in seconds and comes with a heavy duty carry bag. Use indoors or outdoors. High strength durable steel frame. Comfortable strong nylon material. Opens and folds in seconds and comes with a heavy duty carry bag. A fun lucky pup item for children to use while camping, at the cabin, and at home, outdoors or indoors. If you have any questions about this product by Wilcor, contact us by completing and submitting the form below. If you are looking for a specif part number, please include it with your message.